Day 11’s prompt was to write a Tanka (five-line stanzas with 5-7-5-7-7 syllables) – so I’ve used the form to bring an autobiographical poem into being. I had this idea a little while ago: as my partner and I live on a narrowboat, we don’t have a full-size washing machine and either use a little twin-tub (which can be labour-intensive) – or visit a laundrette. On our travels up here to Leeds from Bristol via the inland waterways (see Inland Odyssey posts! ), we used various laundrettes (including my favourite, the ‘Washeteria’ (a delightfully old-school term), which was still pleasingly 1950s/1960s in its layout and appliances, but worked perfectly). 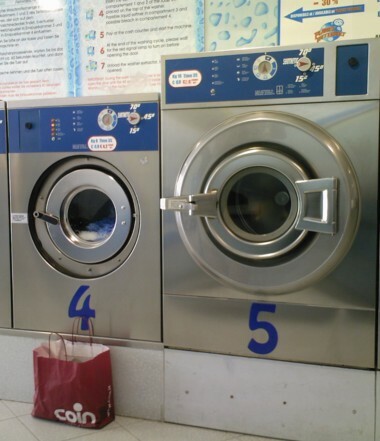 Laundrettes, or Washeterias, can be a really pleasant experience I think – the urban equivalent of gathering at the water’s edge to wash clothes in the river: there’s something connective about it – human, cleansing. So this poem is about the laundrette (the place and the person) we use in Leeds – and about connecting across difference, in this ‘urban riverside’. the laundrette prays to Mecca. a Universe of paired socks.